This entry was posted in Recent Posts and tagged Art, Chances, Choices, Clouds, Dark Days, Devotion, Love, Musings, My Muse, Photography, Poems, Poetry, Proof, Sky. Bookmark the permalink. Oh this is awesome. 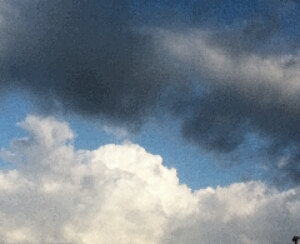 I love that about the darkest cloud and how they’re beautiful too. It’s so hard to see it at the time. Only after the rain we the beauty that it produces. Love the shot. I’m the dark cloud. Rats! You set me up! *looks around for the heifer* Who me?! Why, Duketh…honestly. Reblogged this on … Words Unspoken …. Delightful photo, and so apropos.